The purpose of Worldpeacefull is to educate the world community in positive conflict transformation and to catalyse a vision of living to our highest potential. Susan Carew, founder, is a fool that believes peace is not only possible it is inevitable. She travelled with the famous clown Dr. Patch Adams to Russia to discover positive humour not only heals but unites people. She has felt inspired to find answers by: travelling the world, teaching REAL HOPE anti-bullying, peace & sustainability, produce peace journalism, design wholistic economics, peace philosophy, publicly speak and author books to explore and share the possibilities for peace. “…the culture of peace and non-violence is a commitment to peace-building, mediation, conflict prevention and resolution, peace education, education for non-violence, tolerance, acceptance, mutual respect, intercultural and interfaith dialogue and reconciliation. It is a conceptual as well as a normative framework envisaged to inspire thoughts and actions of everyone. Therefore, it requires cognitive as well as the emotional abilities to grapple with our own situation in a rapidly changing world as well as with the emerging world society. This aim entails not just more factual knowledge, but also the broadening of our consciousness and the willingness to develop a new awareness, a new way of being in this world, a new “mental mapping”. 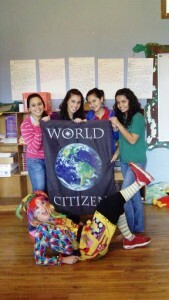 Worldpeacefull focuses on children, workplaces and the community. This work is inspired by the children of the World as they inherit a complex and uncertain future. May their happy destiny be unavoidable!! WorldPeacefull introduces REAL HOPE and wellbeing to facilitate harmony and happiness in schools, business, community organisations around the world as a first step in developing a natural way of being and seeing our World to co-create a World-Peace-Full. * REAL HOPES is the first universal values based model that catalyses unifying virtues within experiential programs that children and adults can understand and integrate. * If peace and harmony is the goal then a Culture of Peace is the solution as pro-social attitudes and behaviours will ripple out from early childhood, empowering the individual, the home, the workplace and the wider community. * Children and adults typically reaCte to conflict rather than learning to C (see) first moving from reaCting to Creating proactively the solutions they require to tackle conflict and bullying in the home, the school, the workplace and the world. They learn to take personal responsibility for thoughts, words, emotions and actions consciously rather than feeling powerless. Powerlessness is the cause of all conflict. * WorldPeacefull educational and facilitative programs develop and catalyse emotional intelligence and peacefull attitudes and behaviours. Most importantly the programs are fun and designed to unlock happiness, a sense of self discovery and awareness. Worldpeacefull is a solution and the beginning of global empowerment which will ensure our planet is not only envisaging sustainability but human evolution where people not only survive but thrive. This is the purpose of humanity! Do You Choose Peace or Conflict?